Fastening a cover down properly can be one of the most challenging endeavors in the covering process. The way in which you fasten a cover down determines exactly how well that cover will hold up in adverse conditions. The reason that many packages become destroyed with rips and tears is usually related to how lose the cover is on the load; the tighter you can make the cover, the more protection you usually have. With the many different plastics and cover possibilities, there comes many different methods of fastening the cover to the load. If you want an even more durable package, apply strapping after the cover or wrap has been applied. Also for woven lumber wrap material we can put a drawstring around the bottom portion of the skirt to enclose the cover. Flexpak is a distributor of Crossfire made by Spotnails. 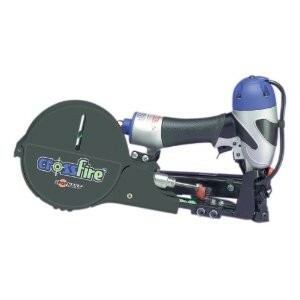 This is a premier staple gun with a staple tab dispensing unit for quick application. 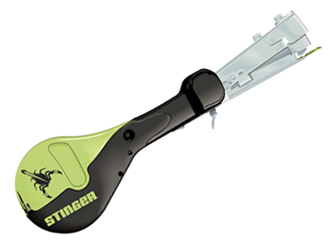 This staple gun is ideal for stapling lumber wrap, lumber covers, and poly covers. Call or Email Us concerning any questions you may have. For Poly Sheeting Covers staples alone will not be sufficient. Though if the staples are applied with staple tabs, the staples then provide much more strength. Strapping works well with all of the poly covers, the downfall of this process is that strapping a package can be quite timely. Call Flexpak with any questions.